When a malfunction is detected for the first time, the 1st trip DTC and the 1st trip freeze frame data are stored in the ECM memory. When the same malfunction is detected in two consecutive trips, the DTC and the freeze frame data are stored in the ECM memory, and the MIL will come on. The MIL will turn OFF after the vehicle is driven 3 times (driving pattern B) with no malfunction. The drive is counted only when the recorded driving pattern is met (as stored in the ECM). If another malfunction occurs while counting, the counter will reset. The DTC and the freeze frame data will be stored until the vehicle is driven 40 times (driving pattern A) without the same malfunction recurring (except for Misfire and Fuel Injection System). 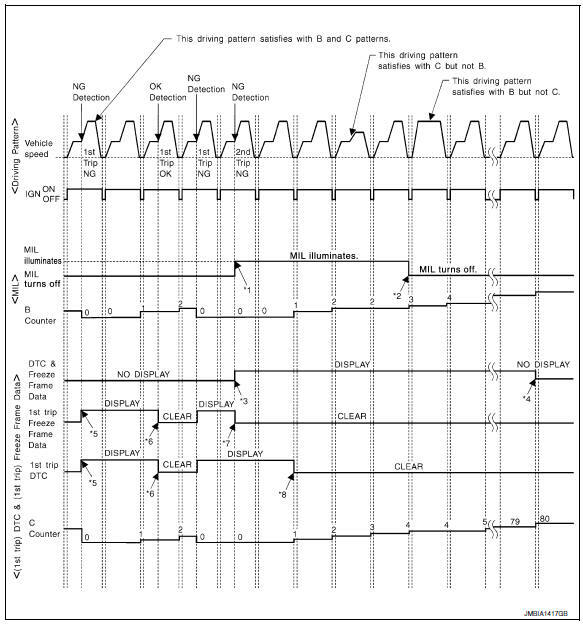 For Misfire and Fuel Injection System, the DTC and freeze frame data will be stored until the vehicle is driven 80 times (driving pattern C) without the same malfunction recurring. The вЂњTIMEвЂќ in вЂњSELF-DIAGNOSTIC RESULTSвЂќ mode of CONSULT will count the number of times the vehicle is driven. The 1st trip DTC is not displayed when the self-diagnosis results in OK for the 2nd trip. For details about patterns B and C under вЂњFuel Injection SystemвЂќ and вЂњMisfireвЂќ, see вЂњEXPLANATION FOR DRIVING PATTERNS FOR вЂњMISFIRE <EXHAUST QUALITY DETERIORATION>вЂќ, вЂњFUEL INJECTION SYSTEMвЂќ. For details about patterns A and B under Other, see вЂњEXPLANATION FOR DRIVING PATTERNS FOR вЂњMISFIRE <EXHAUST QUALITY DETERIORATION>вЂќ, вЂњFUEL INJECTION SYSTEMвЂќ. *1: Clear timing is at the moment OK is detected. *2: Clear timing is when the same malfunction is detected in the 2nd trip. When the same malfunction is detected in two consecutive trips, MIL will light up. 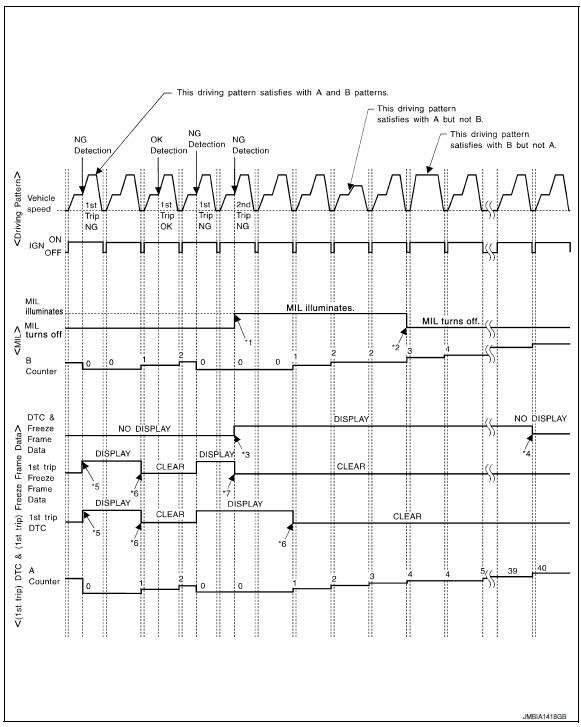 MIL will turn OFF after vehicle is driven 3 times (pattern B) without any malfunctions. When the same malfunction is detected in two consecutive trips, the DTC and the freeze frame data will be stored in ECM. When a malfunction is detected for the first time, the 1st trip DTC and the 1st trip freeze frame data will be stored in ECM. The 1st trip DTC and the 1st trip freeze frame data will be cleared at the moment OK is detected. When the same malfunction is detected in the 2nd trip, the 1st trip freeze frame data will be cleared. 1st trip DTC will be cleared when vehicle is driven once (pattern C) without the same malfunction after DTC is stored in ECM. Refer to EC-60, "DIAGNOSIS DESCRIPTION : Driving Pattern". The DTC and the freeze frame data will not be displayed any longer after vehicle is driven 40 times (pattern A) without the same malfunction. 1st trip DTC will be cleared after vehicle is driven once (pattern B) without the same malfunction.